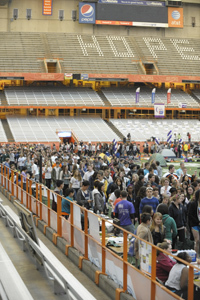 The ninth annual 2011 Syracuse University Relay for Life set a new record this year by raising more than $170,000 for the American Cancer Society. The amount surpassed last year’s 2010 Relay for Life record amount of $153,000. The American Cancer Society Relay for Life events are held in communities around the world in an effort to raise awareness and money in the fight against all types of cancer. Because cancer never sleeps, the relays are often held overnight. More than 250 teams and 2,126 students, faculty and staff participated in the overnight event held at the Carrier Dome April 9-10. The event kicked off Saturday night with 20 cancer survivors walking the opening “Survivor’s Lap” alongside the participants. Outstanding donations can be sent to the American Cancer Society, Relay for Life of SU/ESF, American Cancer Society, 6725 Lyons St., East Syracuse, N.Y., 13057. Participants are asked to send their donations by June 30.